I preheated our Blomberg oven to gas mark 5 – 190 degrees Celsius. Line a baking tray with 12-15 cake cases. Cream the Butter & caster sugar together until it is pale, light & thoroughly combined.. Add the strawberry favoured dessert mix and cream once more. Next whisk in the eggs & vanilla essence until everything is thoroughly combined. Finally add the self raising flour, baking powder and salt and fold in carefully until everything has mixed together and the mixture is thick and creamy. Spoon the mixture equally between the cases. Next take small amounts of strawberry preserve and push them individually into the middle of the mixture in the cases. Gather a little mixture over the top to cover. Then pop them in the oven for 15-20 minutes until golden brown on top. In a small pan, melt the chocolate & milk together and mix until thickened and all lumps have melted. Remove from the heat before it boils or the chocolate burns. Carefully whisk in the icing sugar and set aside. 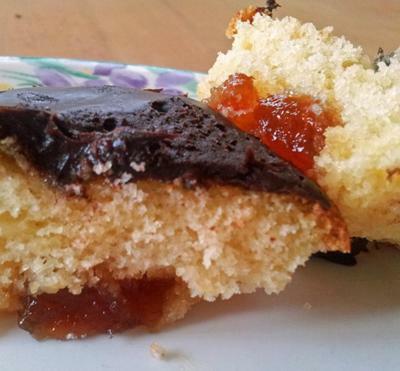 Once you have removed the cakes from the oven, drizzle the dark chocolate sauce of the tops of the cakes. Leave them to cool for about 20 minutes (out of the tray) before serving.